5.0 out of 5 stars"To end war, design a better game!" 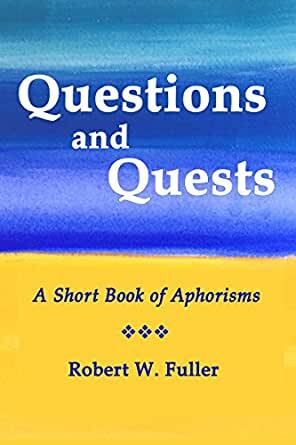 "The Bomb makes nobodies of us all," says the dignitarian philosopher Robert W. Fuller in his new book of aphorisms, Quests and Questions. "The Bomb makes nobodies of us all," and in our new era of brinkmanship with the multiple nuclear powers of Russia and North Korea arrayed against us, and with the always-almost-at-war neighbors India and Pakistan only one silly mistake removed from nuclear holocaust, Dr. Fuller's message acquires an unparalleled urgency. "To end war, design a better game!" This is very good advice, and maybe we should take it absolutely literally, instead of equipping the Pentagon's video-game-warriors with real drone bombs that kill real people. "To end war, design a better game," and I only hope the video-game designers of the Sims and Civilization will take up Dr. Fuller's challenge, and create a Cyber Peace Corps that delivers real benefits instead of mindless destruction. 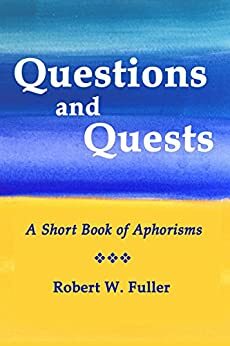 If we can kill at fantastic distances with unthinkable speed and power, I believe we can also find a way to harness Big Data and AI for the purposes of peace and human dignity, instead of allowing our hopeless quest for cosmic supremacy to drive us over the edge of cosmic annihilation so well described by Robert W. Fuller. "The Bomb makes nobodies of us all."